Sunday, Sunday, Sunday.. Stamping! This week, our challenge was to use a plate ending in #8, so I had a little freedom with the colors and theme. I'd just gotten my new Cult Nails Road Trip, Anyone? collex, so I picked a few colors and had some fun. Almost a one-coater, gorgeous, creamy bright mint. Perfect summer color, and, per usual, the awesome formula of a Cult Nails creme polish. The collex came with two toppers, and I chose Mayhem, her new holo topper, to go with Riot. Holos do show up better over darker colors, but I thought this did a nice job without adding too much grey, like some holo topcoats do. 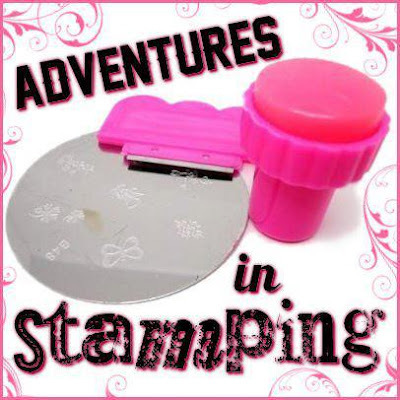 But, today is about the stamping, right? So I used Cult Nails Party Time, a medium blue with a hint of green. And it stamped perfectly with Pueen 18. 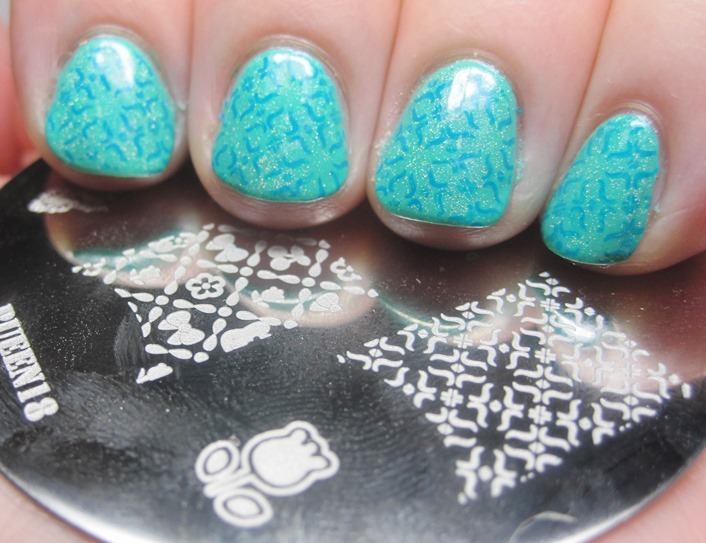 I love a bright color with subtle stamping. Road Trip, Anyone? is the newest collex from Cult Nails. If you'd like more information about Cult Nails, you can find them on Facebook and their own website. I love this look! I want Mayhem so bad! You can get it by itself now, if you don't want the whole collex. Cult Nails will sometimes have sales, too.